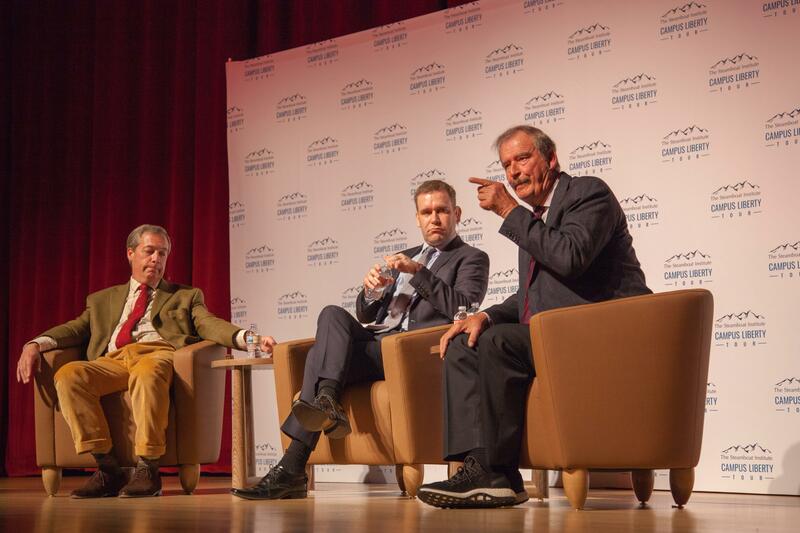 Nigel Farage, left, and Vicente Fox, right, debate the issues of nationalism and globalism in a moderated debate by Tom Rogan, center, April 3. As tariffs and immigration dominate headlines in the United States, two international leaders discussed those issues and many more as UCCS hosted the Campus Liberty Tour April 3 at the Ent Center for the Arts. 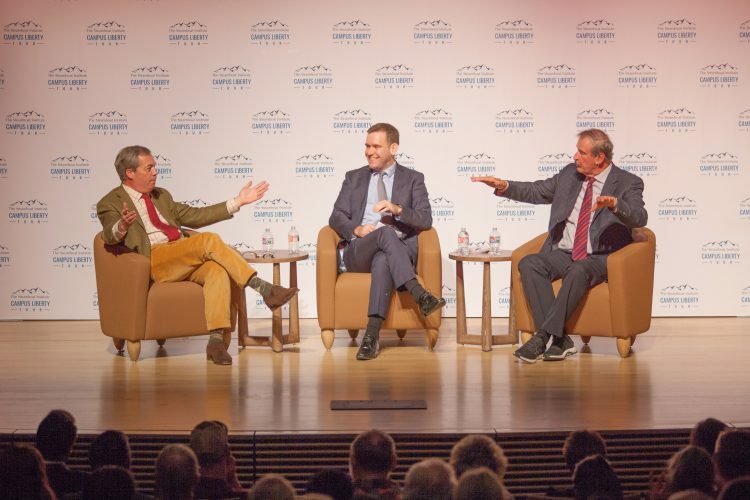 Nigel Farage and Vicente Fox participated in a moderated debate in front of approximately 550 people in the Shockley-Zalabak Theater. Farage co-founded the UK Independence Party and led the successful Brexit referendum, which started the process for the United Kingdom to leave the European Union. Fox was the president of Mexico from 2000 through 2006. Nigel Farage accepts a birthday cake from The Steamboat Institute before the start of the debate. The two leaders exchanged their viewpoints on several prepared questions from Tom Rogan, a columnist for the Washington Examiner, for the first 45 minutes of the debate before he asked questions submitted by the audience. The pair discussed trade, immigration and went into detail on the pros and cons of their respective national and global viewpoints. The two agreed on multiple topics, including the benefits of free trade and the importance of strong democratic processes. The event featured multiple moments of levity, including a birthday cake for Farage decorated as the flag for the European Union with a piece cut out decorated as the Union Jack for the United Kingdom. The tour sponsored by The Steamboat Institute was brought to Colorado Springs by the UCCS Center for the Study of Government and the Individual. The tour started at CU Boulder April 2 will continue at the University of Maryland April 5 and Lehigh University April 6. 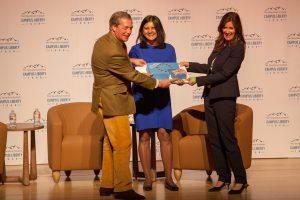 The full debate at UCCS can be viewed here.